NEW YORK ( TheStreet) -- Dillard's ( DDS - Get Report), Ecolab ( ECL - Get Report) and Kensey Nash ( KNSY hit 52-week highs on Monday. Shares of Dillard's hit a 52-week high Monday of $67.13. The stock's 52-week low of $38.99 was set on Aug. 19. Dillard's trades at an estimated price-to-earnings ratio for next year of 12.76 times; the average for apparel retailers is 12.08. For comparison, Chico's ( CHS has a higher forward P/E of 12.87. Two of the three analysts who cover Dillard's rated it hold; one analyst gave the stock a buy rating. The stock has risen 48.6% year to date. The company announced Monday that its stockholder rights plan has been changed so that the Bill and Melinda Gates Foundation and Cascade Investment can acquire up to 25% of Ecolab's outstanding shares in the future. "Q1 adjusted EPS of $0.50 was $0.02 above consensus. Ecolab set a Q2 EPS range of $0.69-$0.72 and reiterated the 2012E outlook of $2.95-$3.05," Jefferies analysts wrote in a May 3 report. "We are raising 2012E EPS by $0.05 to $3.00." Shares of Ecolab hit a 52-week high Monday of $64.88. 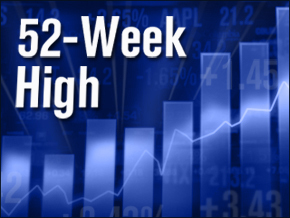 The stock's 52-week low of $43.81 was set on Aug. 9. Ecolab's forward P/E is 18.1; the average for specialty chemical companies is 12.08. For comparison, Mosaic ( MOS has a lower forward P/E of 10.05. Eleven of the 18 analysts who cover Ecolab rated it buy. Six analysts gave the stock a hold rating and one rated it sell. The stock has risen 11.87% year to date. The medical devices company reached an agreement to be sold to Royal DSM for $360 million. "The acquisition of Kensey Nash will expand DSM's established presence in the medical coatings, polymers, and regenerative medicine industries with the addition of the Norian bone cement products, soft tissue repair (ECM and collagen mesh) and adhesives offerings," Jefferies analysts wrote in a May 3 report. "The deal will also expanding DSM's presence into the resorbable polymers with the addition of Kensey's cardiovascular (Angio-Seal), Sports Medicine (resorbable screws and anchors), and Spine (bone minerals, polymers, and collagen) businesses." Shares of Kensey Nash hit a 52-week high Monday of $38.58. The stock's 52-week low of $18.17 was set on Dec. 19. Kensey Nash's forward P/E is 19.4; the average for medical equipment companies is 28.95. For comparison, Cantel Medical ( CMN has a lower forward P/E of 17.43. Three of the five analysts who cover Kensey Nash rated it hold. One analyst gave the stock a buy rating and another rated it sell. The stock has risen 100.47% year to date.